Personal training is our specialty. 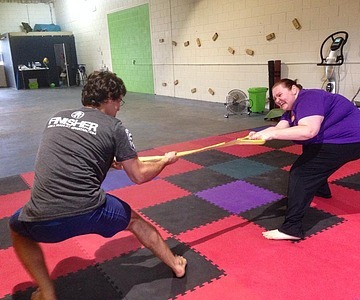 Our one on one training methods allow us to work specifically with you on meaningful goals. Personal training is the most effiicent way to achieve the results you want. Working with Simone and Lachlan to achieve your personal goals gives you the leadership, accountability and tools you need for success. The key to success in achieving any goal is consistent action. Take action now. Personal Training is all about you. Call Simone or Lachlan to book in for your consultation and learn more about how individualised personal training can deliver for you. During my recent weight loss journey it was vital to surround myself with positive people and that is exactly what I got with Simone and the team at Fitness Form and Function. I received the advice, encouragement and exercise plan I needed to achieve my goal and beyond, thanks you so much. Trained for LIFE. That’s what Simone’s shirt said when I met her. Catchy slogan I thought. After six months training with her I know that’s no slogan it is her core belief and it tells you what you will achieve through her training. Emphasis on LIFE. YOUR life. Whatever your goals, your challenges, your needs, those are her focus. I have learnt much from Simone over the past year - the one big one is MOVEMENT and the other is ENJOYMENT. Cairns has many experienced and acknowledged Personal Trainers - I guess it was "my time' to be led to one and the stars aligned with Simone (at that time in my life). It is easy NOT to do - but much more rewarding when you DO something - in the right way and to your ability. Results always come when you DECIDE to DO. Thank you Simone. Trainers come and trainers go but a committed & dedicated trainer is here to stay, Simone you are that person. I have been trained by Simone of Fitness Form & Function for over 3 years. When I first started I was sluggish with stiff joints and lower back pain. Now I am fit, strong and pain free. Where once I had to drag myself out of bed, I now spring out (mostly) Simone keeps her training fun and motivating so you look forward to the next session. I love the fact that Simone is always on a learning curve and uses her years of experience and knowledge for the betterment of each client. Thanks Simone.